Meet Razor Dirt Quad. #1 Electric Four-Wheeler for Kids. The Razor Dirt Quad is the ultimate four-wheeler for kids. Designed for children 8 years and older, this miniature ATV proves to be a thrilling ride. With carrying ability of up to 120 pounds, it is a joy for parents and kids alike. With it superbly powerful chain driven motor and pneumatic wheels, it is the best in class for an ultimate adventure outing. Long lasting battery and twist grip acceleration make for action-packed excitement on a dirt track. Its rear suspension, powerful motor, and high-quality wheels give it outstanding climbing abilities and provide a smooth ride through the toughest terrains. 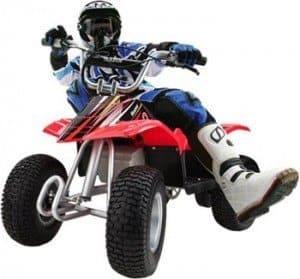 The Razor Dirt quad comes with padded seats and adjustable handlebars to make the ride comfortable, while the young one enjoys the thrill of dirt biking. The terrific thrust of the vehicle makes riding on the sidewalk seem like gliding. The frame is ergonomically designed and is shatter resistant, weather and waterproof, and powder coated. Storage is hassle-free as the 89-pound vehicle can easily be folded and stored vertically in say, the small space under the stairs, with ease. What Makes Razor Dirt Quad Better Than Other ATVs? 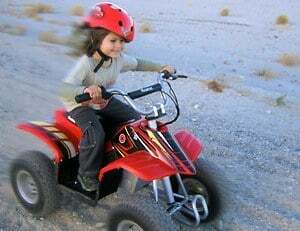 A thrilling ride for kids, the Razor Dirt Quad is the best in class. Longer lasting batteries and potent motor make for a powerful ride like never before. Twist grip controls and hand brakes add to ease of riding, with padded seats and adjustable handlebars to make it more comfortable. Its super power boost can be attributed to high motor-gear ratio. Suitable for dirt tracks and difficult terrains, this vehicle navigates through hiking trails like a pro. Strong suspension, supported with muscular pneumatic tires make for a superb vehicle for upward climbing. 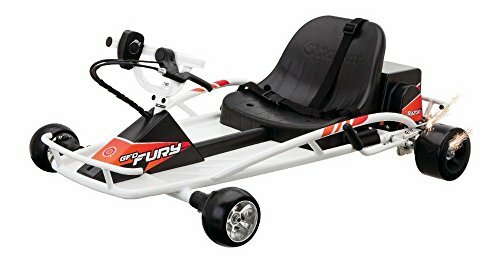 Ergonomically designed, the frame is shattered and weatherproof, making the Razor Dirt Quad an extremely durable “toy” vehicle. Compact storage is an added bonus with its foldable, vertical store-ability. With the Razor Dirt Quad, you get untainted, uninterrupted thrill and adventure, and a ride full of excitement. A definite must-have for families who love spending time outdoors, and enjoy nature trails. Constructed from shatter-resistant plastic fairings on a powder-coated tubular steel frame. Handlebar steering with hand throttle and brake controls. Powered by a 250-watt motor. Reaches speed up to 10 mph. High-torque drive train with built-in torque reducer produces incredible off-road and climbing capabilities. UL listed; requires two 12-volt rechargeable batteries and charger, included. Eight hour charge time provides 60 minutes of riding time. Large pneumatic tires. 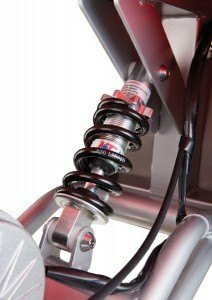 Terrain-following droop-travel rear suspension. Rear disc brake, padded seat and front “brush bar”. Rear carry handle and safety flag. Maximum weight capacity: 120 pounds. Measures (LxWxH) 42.25″ x 26.25″ x 25.25″. Charging With 12 hours of charging, the machine provides up to 60 minutes of uninterrupted dirt track riding. Breaking System The rear disc brake is also hand operated and makes it easier to control the vehicle in difficult terrains. One of the most important pros of the Razor Dirt Quad is that it takes biking to another level. Rising above the rest in the category, this is not just a toy. The electric vehicle is eco-friendly and does not cause any sort of pollution. The welded, powder coated, a steel frame is specifically designed for dirt tracks. 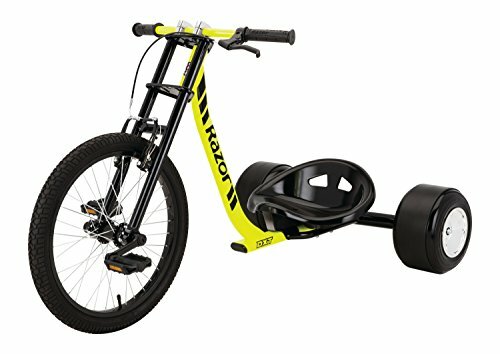 It also has terrain-tracing rear suspension with adjustable pre-tension, and hand operated cross-drilled disc brake; and a 250-watt chain driven motor, with high torque vs. gearing ratio. The four 13” pneumatic tires with precision ball fittings effectively transfer the motor’s power for a great ride. There is also twist-grip acceleration and left hand operated brakes for ease of use and greater control. The steering bar is linear but makes sharp turns easily. Also, it is adjustable to suit the height of the kid. 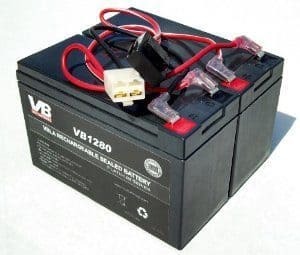 The 24V (2 X 12V) DC, rechargeable leak-proof, the lead battery takes 12 hours to charge completely and provides about 60 minutes of uninterrupted riding. The vehicle is easily maneuvered on grass and gravel, besides the smooth pavement and the roads. The 30A fuse safeguards all wiring. The seat is cushioned and comfortable and is guarded by mud flaps for splatter proofing. All the parts used are high quality and highly serviceable. The powerful machine is more like a vehicle for kids, without all the complexities and the pollution. The vehicle does not have a reverse option. It also has a higher center of gravity, which under high speed, and the high traction, can cause the vehicle to lose balance and get up on 2 wheels during sharp turns. The chances of tipping over may be also pretty high, given the high traction and thrust the motor provides. The Razor Dirt Quad also does not have engine braking, so the vehicle gradually comes to a halt instead of a jerky stop. Parents and kids thus need to be educated about this. There are also no lights, headlights or tail lights, on the Razor Dirt Quad making it unsuitable for riding in the dark. Also, the brake lever is open positioned, which can be difficult to reach for slightly smaller kids. Children must be made to use a protective headgear, such as riding helmet when riding the bike. Razor Dirt Quad is one of the best vehicles for kids, with high-quality products; be it its solid frame, suspension, tires or the motor. It is durable through rough use and is extremely powerful. Long lasting batteries and the ease of operation make it a thrilling investment, for adults and kids alike. The Quad bike is available in stores, but most users opt to get it home delivered due to the increased convenience of delivery. It is also extremely low on maintenance and owners love the vertical storage option. 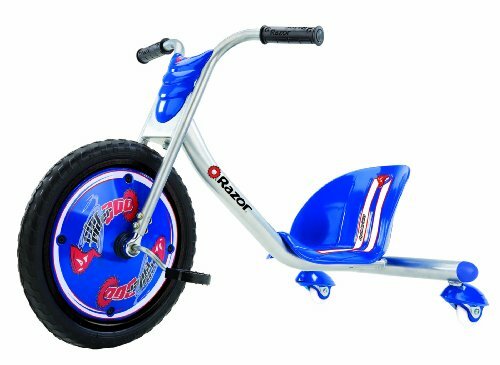 A much-loved product, customers suggest including a reverse mode gave the bike is handled by kids and pulling it back could be strenuous. Also, parental supervision is advised. 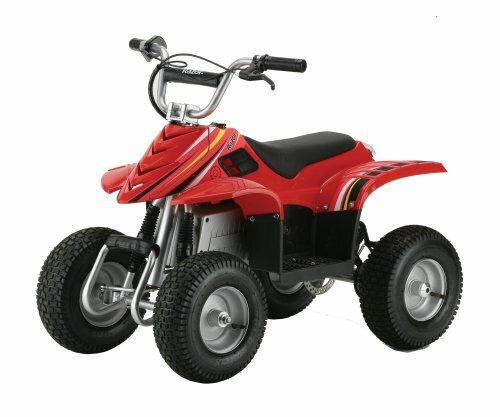 The Razor Dirt Quad is thus, highly recommended by parents and loved by children. After spending endless hours online searching for an “inexpensive” ATV for our seven year son old for Christmas last year, my husband and I opted for the Razor Dirt Quad. The least expensive “real” ATV I could find was hundreds of dollars more than the cost of this Razor ATV (we got a great price on it when it went on sale at Christmas time). The reason I was looking for a “real” ATV in the first place is that everyone I spoke to told me to spend the extra money because my seven year old will “outgrow” this product in no time. All I can say is that even if he outgrows it in another year, it was still worth every single penny we spent. Both of our boys, ages 4 and 6, really love this thing. It’s easy to steer and goes just fast enough. We weren’t ready to shell out thousands of dollars on a gas powered four wheeler that goes way to fast for these age kids. That will be a few years from now. I just wish it held its charge longer than 45 minutes. And it would be nice if it went in reverse, but at least it’s light enough for the boys to move manually if needed. It’s not suppose to go in the mud or puddles, however. We found that out the hard way… the brakes wouldn’t work until it was hosed down and dried out. The Razor Dirt Quad is 95% assembled at the factory. It is then shipped with all the necessary parts that need to be fitted to the main body. The vehicle requires adult supervision, in assembly and operation. An adult, preferably with prior experience in bike mechanics, can easily assemble the bike in about 20 minutes. Razor Dirt Quad then needs to be charged initially. While support tools are provided in the packaging, the use of mechanical grade tools is recommended by the manufacturers. 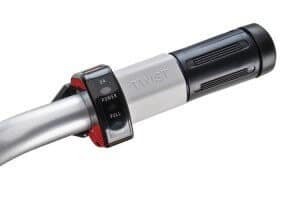 Tools required are: 2.5 mm, 5mm, and 6 mm hexagonal key wrenches (which are included), a 10 mm wrench, a Philips screwdriver, and a bicycle styled tire pump with pressure gauge. The battery needs an initial charge time of 18 hours. The power switch must be turned off while charging. For subsequent charging cycles, a 12 hours period suffices to fully charge the battery. The battery needs to be charged even if the vehicle is not used on a regular basis. Not turning the power switch off while charging can damage the battery and reduce its power holding time. Repeated instances of charging like this may damage the battery to the extent that it may no longer be able to hold a charge. The handlebars also need to be fixed. The clamps included need to be secure and tight, and the clamps should be at level. Both the upper and the lower clamp should be at the same level. The tires are packed in an inflated state. It is recommended to inflate them to the correct PSI, using the bicycle pump, before attaching and riding the bike. The pressure levels are indicated on the sides of the tires. The brakes must also be checked before mounting the four-wheeler. This can be done by simply squeezing the lever and checking the pressure on the brake. The cable adjuster and the level movement can be fine tuned. This can be done as per the instructions in the manual included with the product. A thorough check must be conducted by the parent before allowing the kid to mount and ride the ATV. Make sure the vehicle is running properly, the brakes are functional, the battery isn’t low, and the wiring properly connected. Once all the checks are done, all that is required is to unplug the vehicle from the charger, mount it, turn on the power and drive away for a thrilling ride. These Razor ATVs for kids and teenagers are the best choice as the vehicles are ecologically friendly. Besides, these will not be just leisure for a kid but will develop imagination, creativity, logic and space orientation. The unit turns out to be family budget friendly as well, as it does not need any additional fuel to move and entertain your kids and thus will not drain additional costs forked out for an hour of kids’ outdoor leisure. 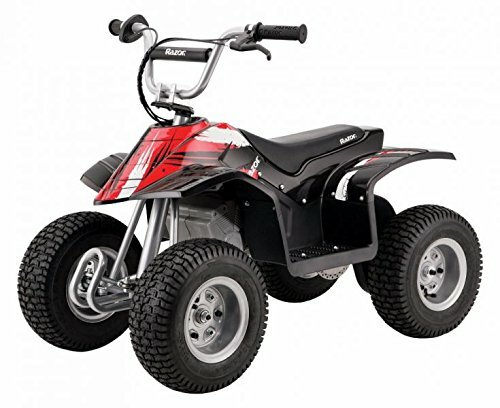 One of these Razor Ride On ATVs will be a perfect choice for a Christmas or birthday present. More and more parents give preference to this unit. You can find this vehicle on Amazon. 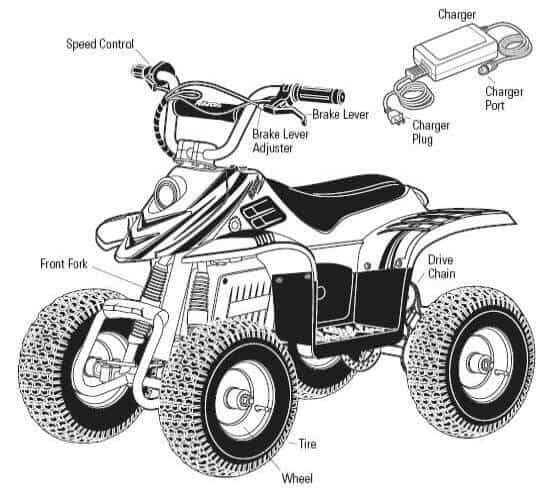 But before you start hunting the vehicle we offer you a comprehensive list of pros and cons of this top-selling sporty and fun battery-run ATV. 13-inch rubber knobby tires put on the Dirt kids’ ATV provide excellent terrain adherence and premium control and ease of terrain mastering – pure pleasure! Additional features include a rear carry handle and capability for vertical storage which will improve the use and storage of the vehicle. 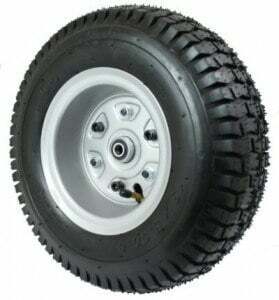 Unlike other vehicles of this kind, the Razor four-wheeler is equipped with real rubber tires. Plastic wheels put on other ATVs competing in the market segment of kids’ quads riding models are pale by comparison to these 13-inch rubber ones. 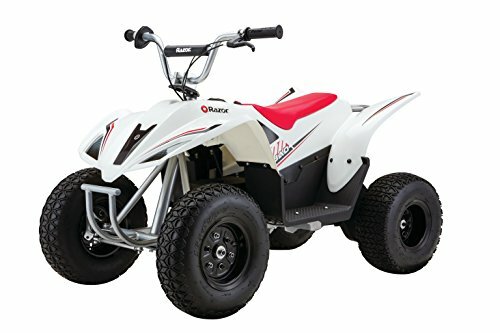 It should be noted that this Dirt Quad Four-Wheeled ATV from Razor Company has gained the best user feedback and reviews and won several awards among which are the Sports Illustrated for Kids and Family Choice. 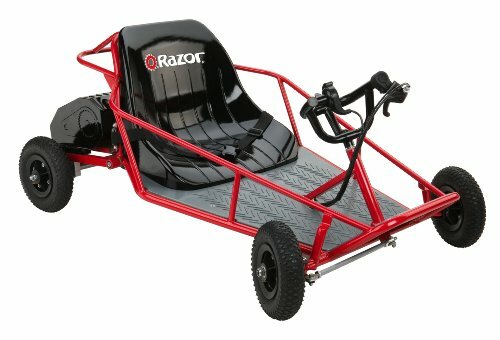 The Razor Dirt Quad is designed for kids 8 years and older. Age limit and weight specifications must be adhered to, considering the nature of the vehicle and the damage it can do if not driven properly. It is also important that the vehicle is driven only under parental supervision to prevent, or contain any mishaps that may occur due to various reasons. Excess weight can lead to short circuits, damage to the wiring, brake fail or motor burnout. It is also advised to not touch the brakes or the motor while the vehicle is in use to prevent any harm due to excessive heat. These parts of the vehicle tend to heat up to high temperatures and may cause burns or injury. The vehicle must not, under any circumstances be put under situations of high stress that may damage the product or pose a serious risk to the rider. 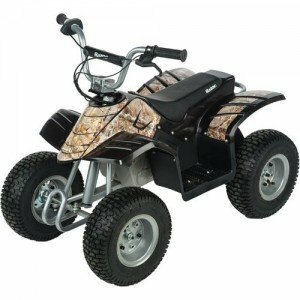 Since the Razor Dirt Quad is a four-wheeler for kids, it is advised to use the product only in private property, or areas where there is a minimal pedestrian or motor vehicular traffic. The speed control on the hand grip must be activated only once the rider is safely and securely seated in the vehicle. The rider must not let go of the handlebars anytime during riding. Also, the use of mobile phones and headphones is not advised. Distance should be maintained from steps and pools, and must always be used outdoors. Also advised, is the use of proper protective headgear such as helmets. Additional gear such as elbow and knee pads, long pants, gloves, and long-sleeved shirt are optional, but recommended. The charger must be used with utmost caution. Recommended for use by adults only, the vehicle must be charged only when powered off to prevent damage to the battery. The charger should not be operated near flammable materials, and time should not be exceeded for charging the vehicle. Razor is a brand dedicated to the innovation and the creation of rides for action sports. The company started with the launch of the original Razor scooter in the year 2000, which sold almost 5 million units in under 6 months. A brand today, their main focus lies in providing exemplary riding experiences, with high-quality materials combined with cutting-edge technology. 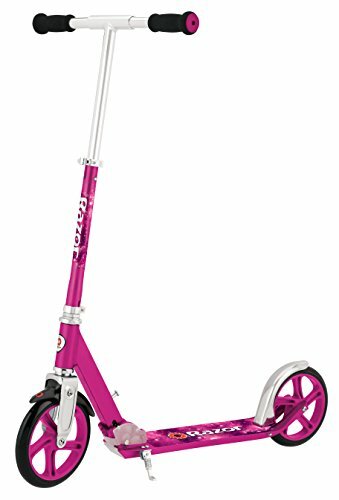 The original A model kick scooter is now one of the “must-have” items for any child, and also a winner of numerous prestigious awards. Razor today offers a wide range of products best suited for the dynamic lifestyles of the riders of today. All of Razor’s products are symbolize free spirit and fun. 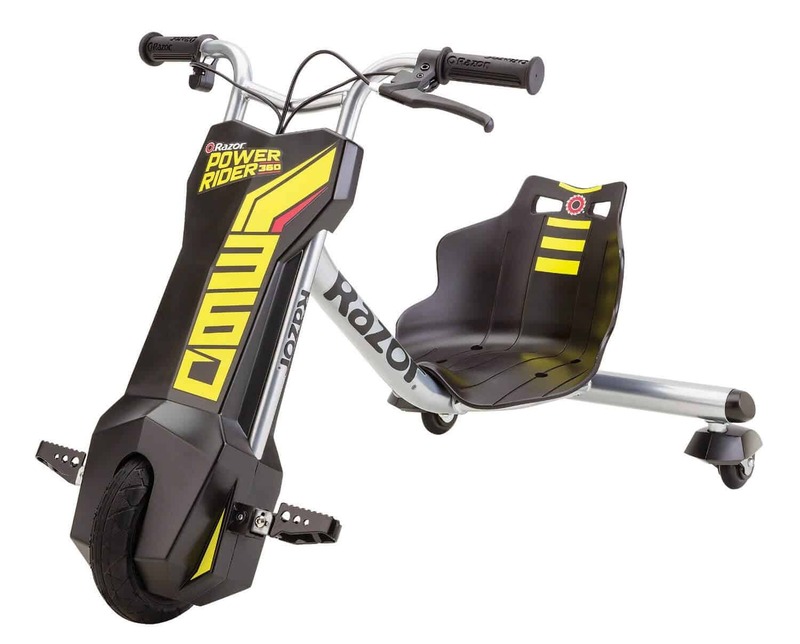 Razor has a wide range of products to suit all lifestyles and all kids. 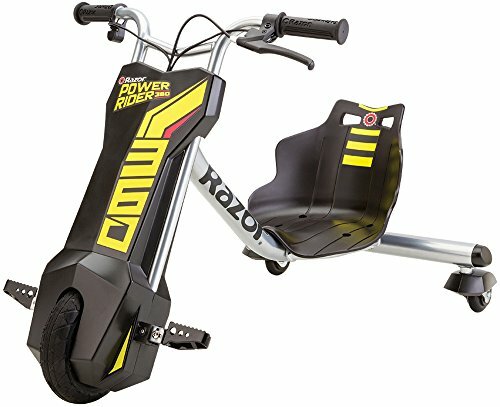 From kick scooters to electric scooters, to power rides, Razor has it all. 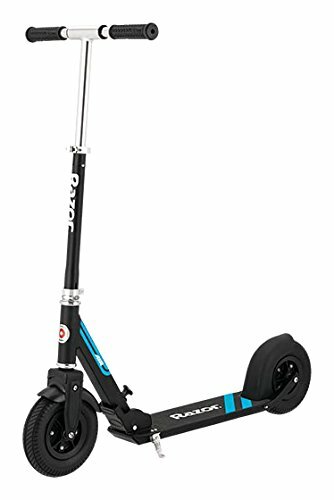 The Razor A Kick Scooter is one of the oldest and most loved products from the company. 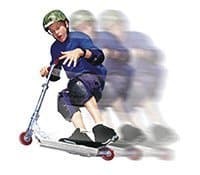 The kick scooter is the ultimate embodiment of the Razor’s vision of innovation and fun. 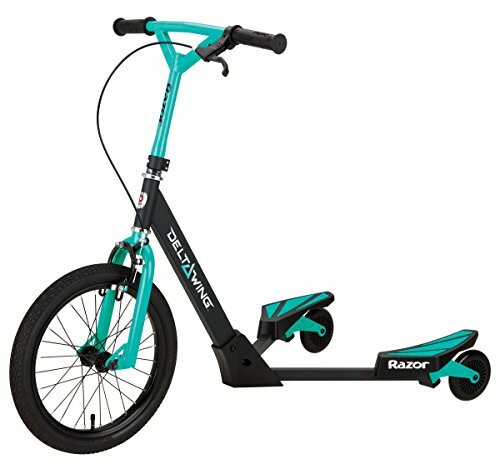 Add excitement to a boring walk with this simple kick scooter. is another product favored by parents. An electric, 3 wheeler, this does not require pedaling and can race at a speed of up to 9 mph. 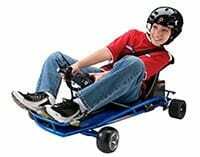 With a push button throttle, the dual inclined caster wheels enable smooth 360 degree spins and amazing drifts. 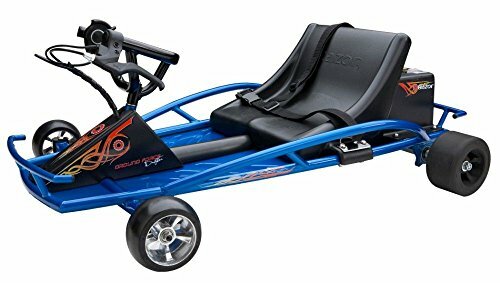 Another superb product from the brand is the Razor Ground Force Drifter Go Kart. The sturdy and powerful design gives complete control to the rider and offers awesome power slides, including a 180 degree and a 360-degree turn. The drifter also has a snug seat with lap and shoulder straps to ensure maximum safety. The Razor Dirt Quad is one of the best four-wheeler for kids and teens. Eco-friendly, using them is very economical and easy. Not only does the vehicle prove to a source of thrill and leisure, it also helps develop imagination, logic, creativity, and space orientation among young minds. It ensures one hour of thrill-filled leisure for children without any additional costs for the parents and the family. A perfect gift for birthdays and Christmas, this is a product the serves parents and children alike. While it is not an actual motor vehicle, it is also not just a toy. Safety measures should be taken into consideration while allowing children to use the vehicle.